There are few writers who are as capable as Michael Lewis at spotting interesting sport stories just outside of the mainstream and fewer still who can match his ability of bringing these stories to life. Lewis, who came to prominence (at least as a sports writer) through Moneyball and who also wrote the book on which the Oscar winning The Blind Side is based, is above all an exceptional interviewer who manages to dig deep enough to get to the soul of his story. Lewis, as you can tell, also happens to be one of my favourite sports writers and when you like someone's writin as much as I do his, you're not going to be satisfied with an occasional book. 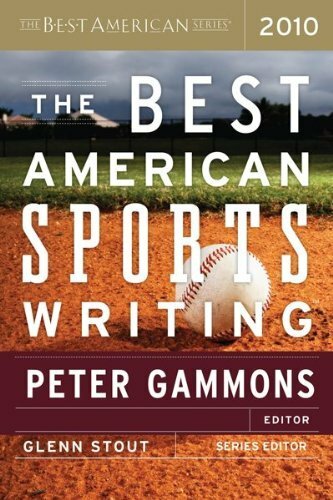 And it was this thirst to get to more of his writting that led me to the Best of American Sports Writing, an annual collection of the best sports writing from America and where invariably Lewis always features. Yet a book that was bought specifically for Lewis' piece opened up a whole new world of fantastic writers and stories. It was also a book that brought to my attention Glenn Stout who happens to be the series editor. Although his own writing is not featured here, Stout does write the a preface to every issue and invariably always manages to make this an interesting read, which is no mean feat. In turn, this led me to look out for more of his work and I discovered an incredibly talented writer who has written a multitude of books on a whole range of topics. It also brought me into contact with a man who is always willing to talk about writing and help out when advice is sought from him. What led you to become a writer, specifically a sports writer? Was that always an ambition for you? Into adolescence all I ever wanted to be, or thought about being, was a baseball player, a pitcher, but at a certain point I began to realize that probably wasn’t realistic. I don’t think I ever thought seriously about being a sportswriter, at least when I was young. I came to writing through poetry which I started reading when I was 13, 14 years old, and was just blown away by the emotional power of words. It changed my life. By high school I was pretty certain I wanted to write. Even though I was taking journalism in high school and writing for the school paper, I saw myself as more of a creative writer and went to college on a partial scholarship in creative writing, writing and studying poetry. Of course there are no jobs for poets, so after college, while floundering around, I consciously tried to combine my interests in writing and sports. I did get a few interviews for small newspapers as a sportswriter, but I had no real background, no clippings, and didn’t get hired. Instead I worked in construction, sold baseball tickets by phone, painted, was a security guard, library aide, etc., ending up in Boston and listening to a lot of rock ‘ roll. I came to sports writing late, when I was 27, 28 years old. In 1986, while working at the Boston Public Library I stumbled across a story about the Boston Red Sox manager committing suicide in 1907. No one had ever really researched the story before and I did, burying myself in microfilm. Long story short – despite the fact that I had never written a non-fiction story since high school, I put together a pitch for the story and submitted it to two magazines. One – Boston Magazine – responded. The editor invited me to his office, talked to me about the story for an hour, and then gave me the go ahead. As I was walking out the door he asked “You can write, can’t you?” I said I could. A week later I turned in the story, he bought it and asked me what I wanted to write about next. I blurted something out and I was off. I’ve never been without an assignment since, often specializing in history. What words of advice would you share with budding sports writers out there? The same advice for any writer in any genre: read everything you can – poetry, fiction, and non-fiction - write as much as possible, develop a wide range of experiences and skills, don’t give up and be patient. Younger writers today want everything to happen instantaneously. Focus on the work and if you are good enough, and lucky enough, the rest will come. Do you ever re-read your own books? Parts of them, because sometimes I have to mine them for information for my next project, or to remind myself that yes, I really do know how to write. It’s funny, but sometimes I have absolutely no recollection of having written what I have. I’ll read something I wrote and in a panic think, “Did that really happen? Is that true?” Then I’ll look it up and find out, yep, that’s how it happened, but I have no memory of ever having written it. I guess that’s’ what happens after publishing upwards of a couple of million words. I saw somewhere that you read poetry outside Fenway Park at the opening day of every season. How did that come about, if it is at all true? And for how long have you done it? In the mid 1980s, before I had published anything, I was just looking for ways to combine my interest in baseball and writing. I had collected a bunch of baseball inspired poetry, and written a bit myself, so I borrowed a small battery powered amp, put on an old uniform, loaded up on Bloody Mary’s and stood outside Fenway beneath the left wall and read poetry for three hours. People seemed to enjoy it – or at least were amused –I found it incredibly energizing, and a few newspaper and radio and TV reporters did stories on me. The next year I sent out press releases, and got more coverage. I ended up doing it for nine years in a row, and actually met people through doing that who later hired me to write for them. You've written about a whole range of subjects: how do you choose which ideas to follow through into books? I try to find a balance between what interests me and what has commercial potential, but it has to interest me first, because if I am not interested there is no way I can interest a reader. I don’t want to be bored while working, so I enjoy trying different projects and subjects and styles – oral histories, biographies, histories, anthologies, juvenile, columns, features, essays, blogs. The last thing I want to do is write the same book, or the same kind of book, over and over. Recently I’ve started consulting with authors who need help with book projects and was surprised to find that not only did I enjoy it, but I was good at it. I am a working writer and I do this full-time, so I have to be open to possibilities, but I try to be selective as well. 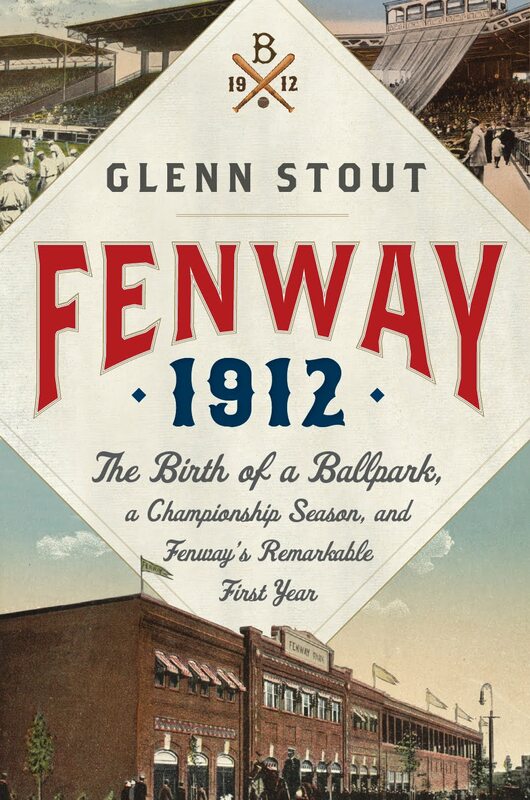 Can you tell us something about your latest book Fenway 1912? In many ways it is the best thing I have ever, ever done. It completely recasts the early history of the park and makes other early histories obsolete. I love finding out new information about something people think they already know everything about. For a place that is so beloved, there was a staggering amount of false information floating around about the place and its origins, from a construction and architectural viewpoint, had never been explored. I tell the whole history of how and why the park came to be built the way it was built, then tell the story of the Red Sox first season in Fenway Park, and how Fenway had a dramatic and profound impact on their performance right through the World Series, which was one of the most memorable in the history of the game. Even the most knowledgeable Red Sox fan or baseball fan will learn something new on almost every page, yet I think the book is still accessible to the casual fan. Judging by the subject I guess that you must have been pretty happy at the decision to renovate Fenway Park rather than build a new ball park. To a point, because the new design, which I called “Fakeway” was really horrible. But there are aspects of the renovation I find troubling. Fenway is unaffordable today, and I find the amount of visual and aural pollution in the park due to a constant barrage of advertisements very distracting. Fenway is a radical different place today than it was even ten years ago. It has not been preserved, really, in any sense, but ironically has evolved that it now shares more in common with the retro parks it inspired – like Baltimore’s Oriole Park at Camden Yards – than it does with the Fenway Park I grew up with. But change is the nature of Fenway Park. It has survived because it has constantly evolved and was never put under glass like an antique. Change was present even in its first season . The biggest change in the history of the park took place in September of 1912, when the park was added to accommodate them 1912 World Series. You're also writing a series a books for kids, Good Sports. Is it more difficult to write for a younger audience? Not for me, not any more. For a number of years I was the non-fiction ghost writer for the Matt Christopher series of books, and wrote thirty-nine 20,000 word sports biographies of people like Derek Jeter and Mia Hamm, so I am accustomed to writing for that market and switching back and forth, even on the same day. The work itself is not all that dissimilar to writing for an adult audience. The research is the same, and the writing standards you try to reach, but the focus is a bit different. The writing is more descriptive and direct. The goal of the series is to encourage reading and provide interesting stories for kids that can provide a lasting lesson. You've been the series editor of the Best of American Sports Writing series since 1991 (happy anniversary, by the way). How did that come about? It was pure serendipity. An editor with Houghton Mifflin came up with the idea, and happened to ask an agent if she knew of another agent who might have a client who would be interested in serving as series editor. She primarily represented cookbook writers, but had recently agreed to represent me on a book project I was trying to sell. She told the editor she had a client who was perfect. And I was. I had read been a huge reader of literary sports writing, worked at a library and had access to material, and was an established magazine journalist, yet I was independent and didn’t owe anyone anything. The editor asked me to put together a sample of the kind of stories I would select for such a book, I did, and he liked them. I’ve been doing this ever since. What exactly is your role in the BASW series? What does a series editor do? My main duty is to survey publications and solicit submissions over the course of each year to put together a group of about seventy-five stories which I give to the guest editor, who then selects about twenty-five stories for the book. I spend a few hours each day looking, and send submission requests each year to hundreds of magazines, have a facebook page for the book, a comprehensive e-mail list, maintain submission information on my website (www.glennstout.net), and in short do all I can to make sure I see and read worthy material. But the guest editor is also welcome to include stories that have not been pre-selected by me. Then I have to write a foreword to the book, the contributor biographies and some busy work. It’s not a fulltime job – and neither does it pay like one – but it is rather constant. At this point, however, it is part of the fabric of my life. Have there ever been stories that you felt should be included but weren't? And the other way round? Oh sure. But on average the guest editor usually picks about 70% of the same stories I would have selected. The only disagreement I really have is when a guest editor abuses their position and allows nepotism or personal relationships to affect their choices, rather than selecting stories entirely on merit. Fortunately it doesn’t happen very often. Has the emergence of blogs, with too many people writing without really considering how they're building their story or argument, diluted the quality of sports writing? I don’t know if diluted is the right word, but blogs have expanded the range of writing in way that in some ways are good, and some ways not. Do you consider blogs for the BASW? I do, and have ever since they began appearing. I believe our first selection from what today could be described as a blog appeared in the book in 2000. I don’t care what the source is - I only care about the quality of the writing. Do you take any measures to ensure that you do not have a bias towards a particular sport? Not really. If we select the best stories that seems to work itself out. We’ve never dropped a story because were “too heavy” on one subject. How is each editions' editor chosen? My editor and I discuss it. I always advocate for writers who have had success not just in newspapers or magazines, but also in book form. I resist efforts to select a guest editor who is not best known as a writer. I hear that this year's editor is going to be a woman. How exciting a development is that? It’s about time, although on several occasions in the past wo0men have been approached and have turned the offer down. In general, about ten percent of the work in BASW each year has been written by women, and I am an enormous advocate of women in sports – including my juvenile work, no American author has written more book titles about female athletes than I have. My biography of Trudy Ederle, the first woman to swim the English Channel Young Woman and the Sea, might be the best book I’ve published to date, and my juvenile series, of which the latest title is Yes She Can! Women’s Sports Pioneers, is getting a terrific reviews. Finally, what's in the pipeline for you? By the time Fenway 1912 appears in the fall I hope to have another big project in the works and hope to continue my juvenile series Good Sports and spend some time supporting that through school visits – two more titles are finished and scheduled to appear this year. The first title I worked as a consultant should also appear later this year, and I know the author and his editors are very pleased, so even though my role is somewhat hidden, I am excited about that - it is an important book about an important subject – not sports. And then every once in a while I’ll get a phone call or an e-mail asking me to work on something I’ve never thought of, and I’m about due for one of those calls. I also have my own blog going, http://verbplow.blogspot.com/, and have recently started to realize that I’m something of a role model for younger writers. I try to be responsive to that and when I think I’ve learned something worthwhile, or have something to say that is not appropriate for another outlet, I make use of that. This article was originally featured on the August issue of Swinging Balls.